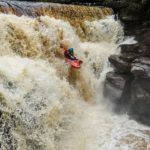 Lower Mesa falls - Alexander Nadauld | DBP MAGAZINE ONLINE The World's Best Free Whitewater Publication. Such a great video! Coolest drop and an amazing line!